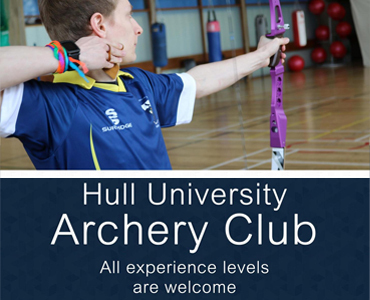 Hull University Archery Club brings the ancient art of shooting the bow into the hands of Hull University students in an accessible and affordable manner. All skill levels are welcome to the club, beginner equipment and professional training is supplied to all members, we also have trainers and equipment available for disabled archers so everyone can get involved. For students interested in getting competitive we participate in the NEUAL league where we compete against other Northern English Universities, travel is provided free of charge to NEUAL and BUCS competitions. Experienced archers are able to bring their own equipment; we support traditional archery, barebow archery, Olympic themed archery and compound archery.